Circuit: COLOR FILM MAKES OPTICAL FILTER __ Circuit designed by David A. Johnson, P.E. This isn’t an electronic circuit but the file shows the curve for an optical filter made from exposed color film. The material blocks most visible light but is very transparent to 880nM infrared light. Kodak 100ASA is exposed to "cool white" fluorescent light for about 5 seconds. Then, the film is developed in the usual way. 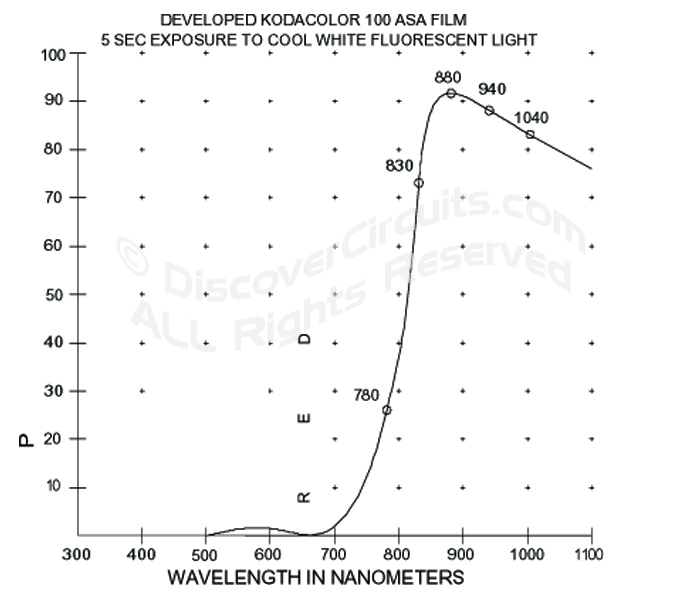 The color negatives form the filter material and does a fine job of blocking visible light wavelength and passing the longer near infrared wavelengths.